The most heavily armoured of all the gladiators, the crupellarius were slow to move, but well protected should they be struck. So well protected was the crupellarius, that they resembled a medieval knight, covered from head to ankle in metal body armour making them impervious to many traditional attacks from their foes in the Colosseum. Being so heavily protected mean’t the crupellarius gladiators were typically physical specimens, strong and heavily built so they could effectively carry the weight of this powerful armour. Without a real strength there was no way this gladiator could have stayed in the battle for very long. Armed with a traditional Gladius sword the crupellarius was reliant on slicing, stabbing or thrusting towards their foe. With the heavy armour and a shield already providing a heavy weight, a lightish weapon was probably a necessity for these gladiators. A crupellarius gladiator in his battle stance. With their shield as well the crupellarius would be able to close the distance on their foes safely, and stab or thrust their gladius towards their foes with ease. 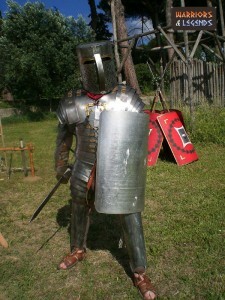 If the enemy got too close this gladiator could even whoe their foes back using the weight of their sheild and armour. As we already mentioned in the introduction, the crupellarii was easily the most armoured gladiator of the time, but on the other side, they were also the most encumbered with the heavy weight of their protection. The armour used by this type of gladiator is easiest to describe as what many would consider to be medieval armour. The actual technical term for there armour was lorica segmentata or laminata and was essentially an adaptation from the typical roman soldiers armour but extended much further than the torso and shoulders. 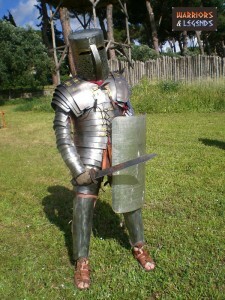 The unprotected areas that differentiate this style from medieval is the absence of gauntlets and sabatans, which are the hand armour(gauntlets) and foot armour(sabatans). This meant that a wily competitor to the crupellarius might actually target these areas to try and counteract this gladiators heavy protection by striking them at their weakest points. The helmet used by the crupellarius was a metal bucket shape with a small slit for the eyes. This would make them well protected to head strikes, but would also make it hard for them to see their foes as easily as they might see them. A crupellarius gladiator in his full armour. In addition to their armour, and helmet the crupellarius also had another bonus to their defence a powerful shield. The shield itself was almost a standard issue Roman scrutum, an could be oval, rectangular or circular, but was most likely a rounded rectangle shape. Typically made form wood in a laminate type format and bound in canvas or leather, the scutum was powerful enough to deflect blows and projectiles but also light enough to be easily handled with one arm. The crupellarius is such a unique gladiator, there is not much information on this class, and therefore it’s hard to determine who they actually fought in the amphitheater. In Rome, the weather was hot, and with the pressure of fighting in the Colosseum bearing down on you, movement might be even harder than normal. For the crupellarius gladiators this was amplified even further by their protective armoured shell. The advantage in battle for the crupellarii would come in close quarters. Their weapon the gladius sword did not have a long range and in close their shield would offer a first line of defence. These gladiators were often patient tacticians, who knew that their armour could protect them against all but the most deadly of blows. Additionally their opponents would quickly tire too, even more drained and demoralised by their efforts of attack having little effect on the crupellarius. With this in mind, the crupellarii played a patient game, let their foes tire themselves, then they can strike back. Fighting against a more agile and mobile target essentially forced the crupellarius to fight in this patient style. Only once the fight was gone from their opponent would they move forward and counter more actively, looking to inflict damage on a more stationary target. To be a crupellarius gladiator was both a burden and a benefit. One one side they were immobile, had poor vision and could not react as fast a less armoured foe. On the other hand they were less likely to get damage from a successful attack from their opponent and were much more durable and hardy. Keen to draw a fight out into the later stages the crupellarius were both strong and patient men. They would have to bear the weight of the armour and bide their time before attacking with precision and poise. You could classify the crupellarii as being the most armoured but at the same time the most vulnerable from their lack of mobility.